Moorhens are marvellous! The common moorhen is easily recognised by the red ‘shield’ on its forehead above its yellow bill — but even more so by the funny back-and-forth bobbing of its head and up-and-down jerking of its tail as it swims. Sillier still, when out of the water the moorhen looks mismatched with its legs, like one of those picture books where the pages are divided in thirds and you can combine a variety of heads, bodies, and legs. The moorhen’s black, pigeon-sized body is perched atop a pair of gangly green-yellow legs with ridiculously large toes, which are not webbed — hence the moorhen’s need to exert itself so when swimming. For a waterfowl the moorhen is not particularly well-adapted to swimming. Nor is it a graceful flier — the long legs stick out behind it in the air. But moorhens are meant to forage at the waterside, and it is here that their too-large feet shine. 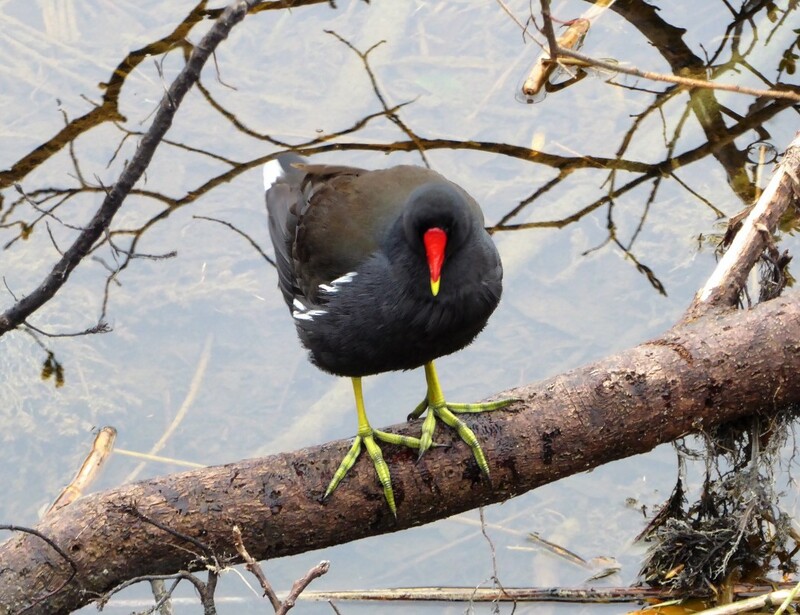 It has a funny, awkward gait — much like a person walking with snowshoes — but, like snowshoes, the extra-long toes support the moorhen on the littoral vegetation as it feeds. 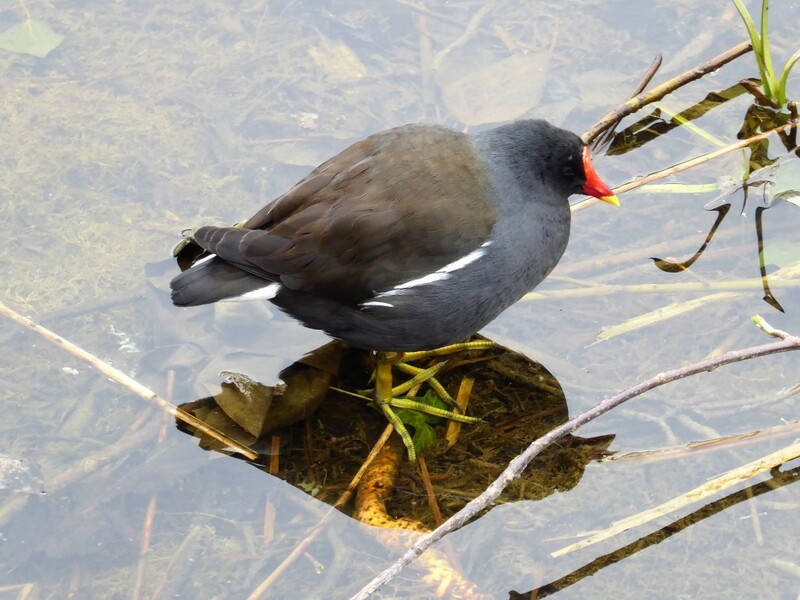 Moorhens live throughout Ireland on practically any freshwater. They build their basket nests in dense reeds or other vegetation near the shore, and both parents incubate and rear the young together. When threatened, the young can use those long, long toes to cling to on the parents, and if the threat is dire enough, the adult can even fly away to safety carrying the young. Eggs are laid between mid-March and mid-May and hatch about six weeks later, so keep an eye out for them along canals and rivers. In Galway City, I know of several nesting pairs along Eglinton Canal through NUIG and by the convents, and on the Gaol River by the Cathedral. There are surely many others. Whimsical wagtails are even more common in Ireland than the common moorhen. The black-and-white pied wagtail is, in fact, the most common breeding bird in Europe, ranging from Iceland and Norway south to Spain and Sicily. These distinctive small birds seem to be everywhere, from moorland and mountaintop to city centre. Wagtails nest in small holes — in hollow trees, fallen logs, stone walls, abandoned cars…. Practically anywhere the opportunity arises. Social birds, they have been known to roost in flocks numbering in the thousands. Like many small creatures, the wagtail seems possessed of an excess of energy — it almost never stops moving. And on those rare occasions when it does stand still for a moment, it wags its long tail up and down — hence its name, obviously. 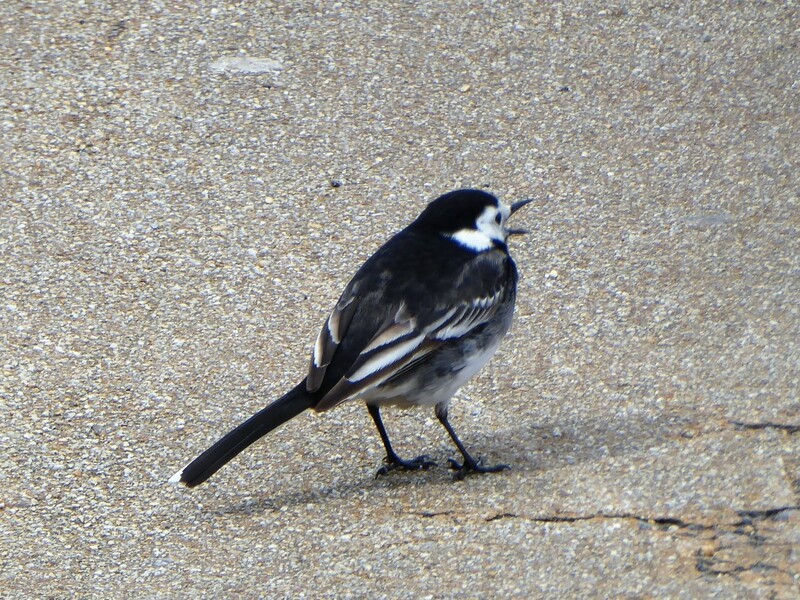 In the words of the English pastoral poet John Clare, ‘Little trotty wagtail he went in the rain / And tittering, tottering sideways, he ne’er got straight again.’ Seeing a wagtail bobbling along never fails to amuse me. They run in and out of pedestrian traffic downtown, they flit about in the woods when I run, and they even hunt for treasures in the rafts of detritus that catch on the chains across Eglinton Canal. Wagtails are always eating, needing to feed all that bustling energy. Although primarily insectivorous, the wagtail hasn’t gotten where it is today — which is everywhere — by being picky. One website notes with typical English understatement that ‘some wagtails show a liking for cake crumbs’. Ha! They should see the brazen little plumper who lives outside the Gourmet Tart on Raven Terrace — he is practically tame, and will peck around my feet or even perch directly on my table waiting to glean my pastry crumbs. On nice days when the door is propped open, I have seen him hop boldly inside, even, without a care. Like pigeons, crows, and gulls, moorhens and wagtails are so common that our sight can become wearied of them to the point that we simply stop noticing them, and they fade into the background of daily life. How often do we notice the pavement we walk upon, or the clouds overhead in winter? But our attention fails us at our peril. Bad hearing runs in my family; I have always had some trouble hearing clearly. (The years of loud music when I recorded punk bands and ran sound at live shows I will accept as being my own fault entirely.) Finally, after decades of desperate need, I scraped together the money and bought hearing aids last fall. The first day I wore them, as I walked down the canal I heard the birds singing all around me, and I began to cry. I had not heard them before; other than gulls and crows and pigeons, I had not heard birdsong for at least 10 years (and crows and gulls and pigeons do not exactly sing…). Barring accident or illness, hearing fades gradually, and we don’t notice its loss from day to day. I had not noticed birdsong leaving my life; how does one notice absence? It never occurred to me that I wasn’t hearing birds singing — I just assumed that there were no birds around me, or that those that I did see were silent. You don’t appreciate what you have until it’s gone, the saying goes, but I hadn’t even realised what was gone. That first day I wore my hearing aids and I heard the birds singing all around me, I began to cry, because it was only that I realised just how poor my life had been for the last 10 years. Wagtails are seemingly as plentiful as trees. If one tree among many is cut down, we may not notice, but when they all go — as recently happened when Eglinton Canal was so roughly denuded — we cannot help but notice and feel the loss keenly. But only, it seems, when it is too late. Trees may seem to be plentiful, until we remember that only a few hundred years ago, native forests covered 80% of this island. Today, only 10% of Ireland is forested (and most of that is non-native plantation forest), making Ireland the least-forested nation in the EU. The Irish Wildlife Trust recently called on the government to adjust the Common Agriculture Policy (CAP) to support the ‘rewilding’ of land in certain areas by paying farmers for not farming. The current CAP makes payments based on land area that is in agricultural production, regardless of whether or not it is suitable. This encourages farmers to set fires to clear out gorse and other brush, drain wetlands, and even remove re-emerging native woodland. Not only does this destroy native flora and habitat for fauna, but the spread of agriculture to unsuitable land increases fertiliser and pesticide use, and the clearing of land increases run-off, so that the number of Irish waterways listed in ‘pristine’ condition has declined from 500 in the 1980s to just 21 today. Widespread drainage driven by policies to increase available agricultural land has further altered the natural functioning of nearly all of our rivers. But these things happen slowly, and often far out if sight, so that we are not likely to notice the small but inexorable changes. We may not be aware that things have changed at all unless our grandparents tell a ‘back when I was young’ story. Common moorhens and wagtails are Green Listed in Ireland — but even their numbers are declining in some areas. The moorhens’ wetland homes are under threat from development, drainage, and pollution. Wagtails, too, although not waterbirds, depend on abundant freshwater for survival. People used to complain about the corncrakes’ cries keeping them awake on summer nights — yet now the corncrake is rare enough in Ireland that being wakened by one is practically a privilege. Farmers and gardeners rail at the woodpigeon for eating up their plantings, but one has only to walk through Barna or Merlin Woods and hear that haunting hoo-HOO-hoo-hoohoo to be filled with enchantment and peacefulness. How poor our woods would be without those mysterious and mournful voices. Seeing wagtails wagging their tails and moorhens chugging their way through the water always brings a smile to my face; if I saw fewer of those silly, pantomiming birds, my smiles would be fewer, my happiness diminished in some small way. When a species becomes threatened, we often rally massive resources to protect it, as we ought. But we seem to see these cases in isolation. The corncrake. The pine marten. No one worries about moorhens or wagtails or woodpigeons, because they seem to be ubiquitous. But we should pay attention to them all, because everything is connected. Today the corncrake, tomorrow the wagtail — it seems unlikely given their numbers, but the same was once thought of corncrakes. Or rather, it was not thought of at all, because they were so common. And yet now, how much poorer have our lives become for their absence? The corncrake’s cry is celebrated in song and story, so much so that it is almost a part of the Irish psyche — yet almost no one these days has heard one. If we start to see nature as a system — there is a reason we use the term ecosystem, after all — in which everything is connected and has a role, no matter how small or seemingly unimportant, we can learn to appreciate the common just as much as the rare. We can learn to become concerned when the common becomes less common, not only when it nears extinction. Preserving a whole ecosystem rather than isolated parts sounds like a larger job, yet precisely because everything is connected it will be easier in the end. Learning to take as much joy in the common as in the rare and unusual — taking as much joy in seeing a hundred wagtails every day as in seeing a single harrier — can help us appreciate the small things in life. And our lives will be the richer for it.